1. Turn ON the printer. 2. Press * and # keys simultaneously. 3. Enter ‘123’ on keypad. 4. At ‘Service’ menu, click the Right Arrow 7 times until ‘Reports Menu’ is displayed. 5. Select Ok, then click Right Arrow 2 times until the ‘print-mech button tap’ menu is displayed. 6. Select Ok (‘code = 0’ will be displayed); click and hold Right Arrow until ‘code = 43’ is displayed or enter 43 on keypad. 7. Select Ok. The ‘Tap 43’ diagnostic test page prints. 8. Check the 4th line at the top of the printed report; an electrically good/stable PRINTHEAD ‘Pen Status’ will state “Pen Status: Pen OK”. 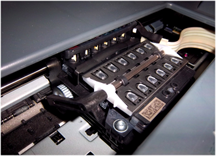 NOTE: The electronic printhead, which the ink cartridges plug into within carriage, is responsible for pulling ink from the 6 ink cartridges and firing ink drops onto the page, will eventually fail over time. This is primarily based on a combination of total printed pages (rated duty cycle) vs. image content and printing frequency. Dry firing, where one particular color is not printing, can significantly increase the chances of a permanent printhead failure.